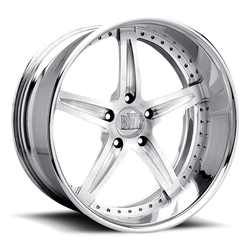 Boyd Coddington Wheels proudly offers custom forged billet styles made in the USA. This wheel is built-to-order with your desired bolt pattern and backspace, and the lead time is approximately four to six weeks. Please call us to confirm pricing and availability for the following add-ons: satin finish, powder coat, paint, brushed finish, clear coat, 6-lug configuration, and 8-lug configuration.